The Department of Transport announced on Monday (25 January) that it would allow electric cars to use bus lanes in several cities. This came as part of the £40m Go Ultra Low City Scheme won by Nottingham, Bristol, Milton Keynes and London set up to implement a series of measures to encourage motorists to switch to electric cars across the UK. it is important to note that this scheme is a partnership jointly funded by some of the biggest car manufacturers such as Audi, BMW, Mitsubishi, Nissan, Renault, Toyota, Volkswagen. We consider this to be the wrong approach as it does not truly address congestion nor pollution issues. In the long run, as numbers of e-vehicles grow, the impact on the environment will simply be displaced somewhere else as it is not green to build this type of vehicles. This measure is also likely to cause more disruption by clogging up the road further, delay bus journeys and be a dangerous addition to other users of that space. 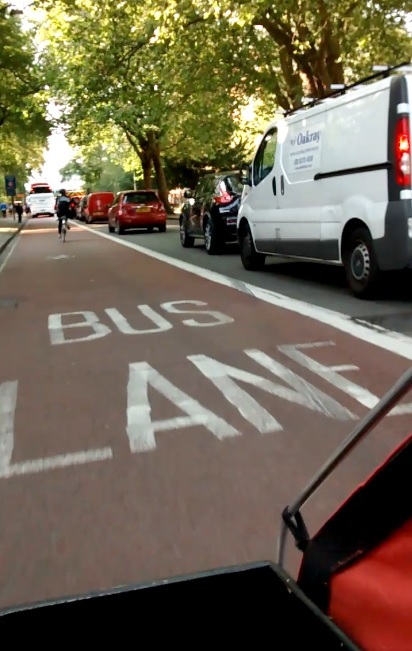 Bikebiz reports that according to the Norwegian Public Roads Administration, electric cars – which have been allowed in bus lanes for some years – represent nearly 90 percent of motorised traffic in the bus lanes during rush hours. If the UK is truly committed to making the country greener as it claims, then surely the government should do more to encourage and promote environmentally friendly ways to go from A to B such as walking and cycling, which include cargo bike use as one viable alternative to inner-city car usage for families as well as businesses.